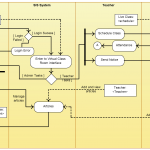 Deployment diagrams are one of the Unified Modeling Language models. Deployment diagrams would illustrate a set of nodes and their respective relationships. These nodes are described as being physical entities where the components are deployed. Deployment diagrams are used for visualizing the deployment view of a system. These are a few examples for Deployment Diagram and you can click on the image to modify online. 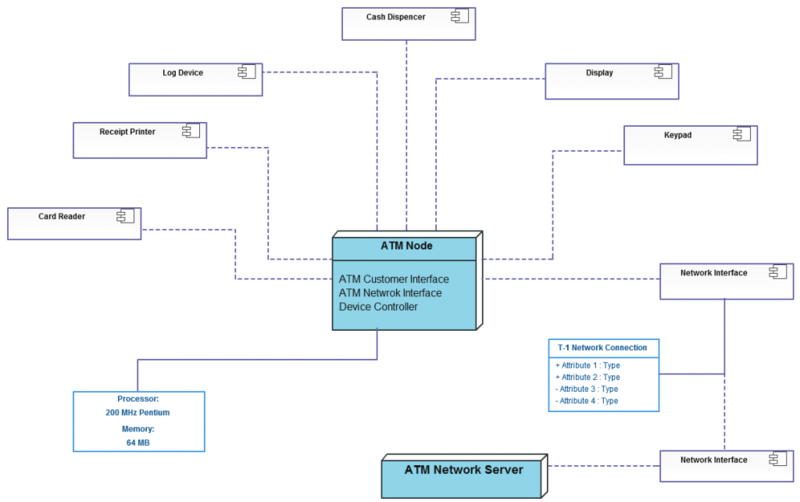 This diagram template shows the work of the ATM (Automated Teller Machine) banking system that is used for service and performing of the banking transactions using ATMs. You can click on the image to use it or modify it. Deployment diagram template illustrates the Online shopping system. This sample shows the concept of the online shopping, and is used for the understanding of the online shopping processes of the online shops working processes, for projection and creating of the online stores. Click on the image to modify online. An example diagram for an online vehicle registration system using deployment diagram. This involves multiple relationships and flows in the system. You can modify as per your requirement, online by clicking on the image. This diagram illustrates the deployment diagram template for online bank transaction process. This process involves with the relationships of inquiring bank statements, fund transfers. Click on the image to modify online using Creately. With this diagram template, I would like to wrap up. You can also visit our diagram community to access more deployment diagram templates or to search for a particular activity diagram. Also, please stay tuned with our example posts category for more and new example diagrams. thanks for posting.I have marked it.this article is very useful for me.very interesting. Nice post. I found this really very interesting. Keep sharing.